Created by Hannah Louise, Astrid and Hanna, three Dubai-based friends, Halm sets a new benchmark for regionally-designed accessories. Understated yet unquestionably sophisticated, the trio transform luxurious leathers in resplendent hues into sleek and timeless silhouettes. We get to know the creative team behind the brand and find out about their first collection, centered around the Scandinavian design concept of minimalism. H: One of the most beautiful aspects of living in Dubai is the diversity in demographics and the exposure to extensive networks, which is probably far greater than any other city. Astrid and I were fortunately introduced by mutual friends a decade ago and we’ve worked on various projects together over the years. I carried out considerable background research before we set up officially and once this was completed, the stars were aligned work-wise and Astrid joined me to focus on business development, supply management and marketing. A: We then searched high and low for the right person to join us. While we knew we wanted their focus to be on design, we didn’t want someone who thought they would be doing only one thing to come on board. We were very fortunate to meet Hannah Louise who joined us from America where she had been working as an accessories designer. Why did you decide to launch Halm? H: Halm came from an innate creative desire, it’s a concept which had been brewing for a long time and stemmed from the creative influence of my grandparents. From the age of 8, I was stitching bags and clothes and experimenting with upholstery. 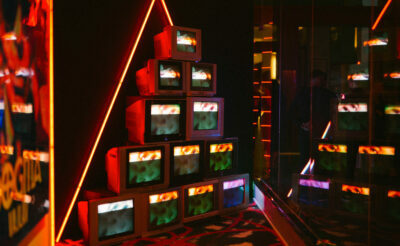 My career took me into interior design and Halm was a natural evolution from this. I wanted to create handbags that enhanced the natural beauty of leather and demonstrated the quality and craftsmanship that goes into creating them. As well as this I wanted to merit the somewhat lost appreciation for true handicraft, traditions, and the generations of talent behind the leather industry; going against the grain of mass production. H: Halm’s debut collection 1:1, is inspired by the combination of functional, minimalistic Swedish design and laid-back, understated luxe. It reveals relaxed silhouettes in a trans-seasonal colour palette. Art, quality and design are at the core of our brand concept and design aesthetic. 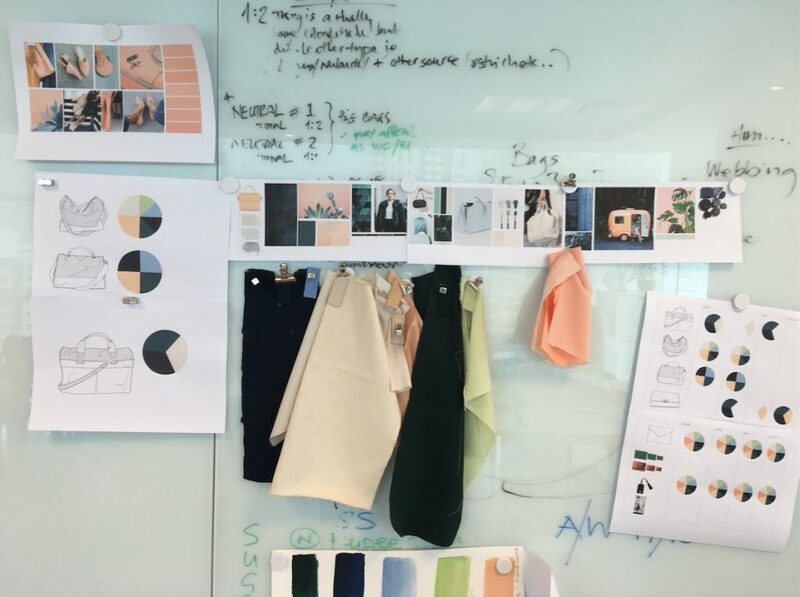 HL: All aspects of the design process, from initial inspiration, sketching, development and production of prototypes to range and collection building is carefully considered by Hanna and myself. 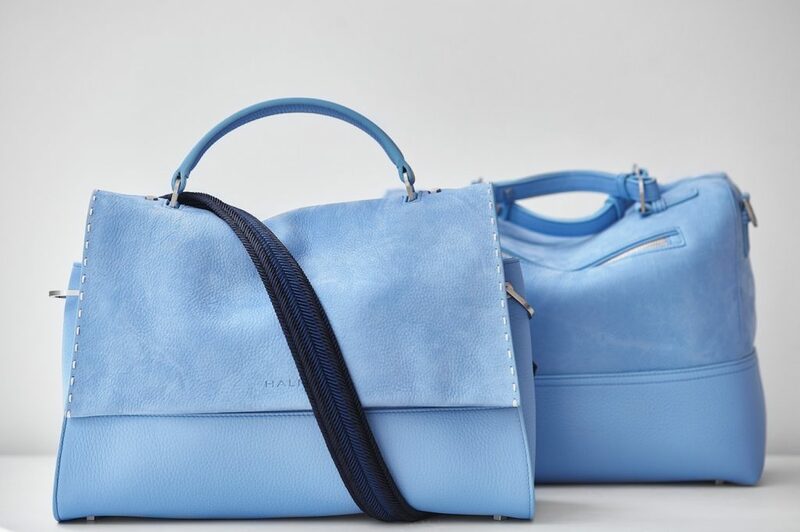 This includes not only the bag designs, but the bespoke components which make up the bags: signature Halm hardware, lining, pouches and packaging to name a few. The Halm collection is 100 per cent Italian made, when a design is signed off on in Dubai, we take it to our manufacturer in Tuscany where (with a lot of collaboration from Hanna and myself) the process of refining to achieve the final product begins. A: The three of us have personally sourced all materials and manage close collaborations with suppliers, tanneries and manufacturers in Italy and France to ensure quality of design and production is achieved. H: A great asset to the Halm design process lies in our Dubai based workshop, it allows myself and Hannah Louise to experiment with design ideas, and develop prototypes on a daily basis with a completely hands-on approach together with our experienced and talented master cutter, Musthafa. What was the concept behind your first collection? H: We recognise that the world hardly needs another handbag. Our vision is to create a coveted aspirational brand that celebrates the authentic, the curated and the unusual.We designed the HALM collection to meet the needs of the contemporary woman who regardless of age, fulfills multiple roles and requires more than one aesthetic. 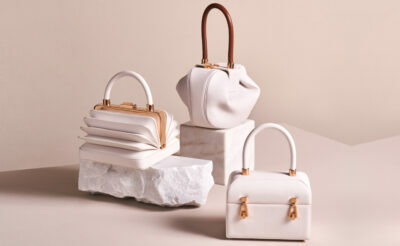 We wanted the bags to be versatile, practical and to exude effortless style, whilst taking on a fresh design identity. Tell us about the silhouettes within the collection. HL: We have launched with five silhouettes, complemented by two sizes of signature pouches. 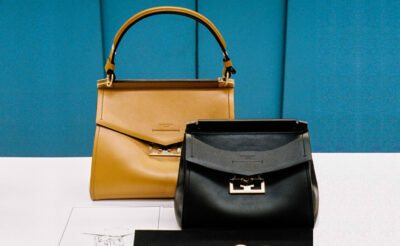 Each bag in the collection is a stand-alone piece, designed to be interactive with other bags within the line. The key focus when designing the line was on creating a tonal aesthetic, by adding interest through textures. The Tote is the largest bag within the collection, designed to take you from A-B with travel in mind. 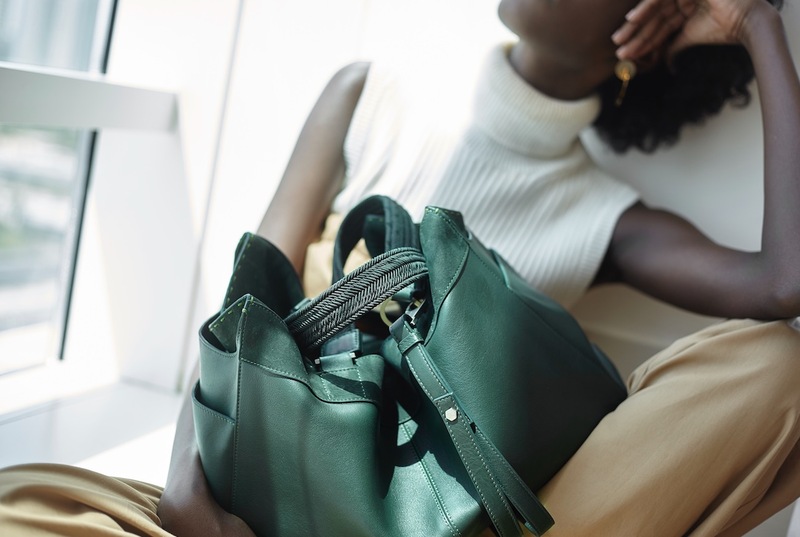 The Chilluxe is seen as our signature Halm bag and is the epitome of understated luxury. The Boxer is slick, confident and contemporary, this is your everyday bag. It’s available in a wide range of colours also with a removable signature strap. The Tutti is a small, sleek wallet clutch with a removable shoulder chain and signature webbing handle. What challenges and difficulties have you faced starting your brand? A: We deliberately chose to produce our bags with some of the top suppliers in Europe. However, being based in Dubai this inevitably comes with some geographical and logistical challenges. Despite their extensive experience and professionalism; time zones, shipping, restricted lead times, and human error will always keep us on our toes and causes us to problem solve and become even more focused. What do you like most about working altogether? H: We can be focusing intensely whether working on a singular task, or juggling 13 at once – a strength we all have individually and as a team which I love and don’t take for granted! We have an incredible energy between us, we complement each other and as a team we conquer challenges, inspire, and create… as well as have having too much fun in the process! It’s a brilliant balance. H: We are imminently moving to a new office and showroom in D3 and hope within the coming months to grow the Halm team. As well as collection 1:2, we are also excited to be working on our Ethos by Halm collection. 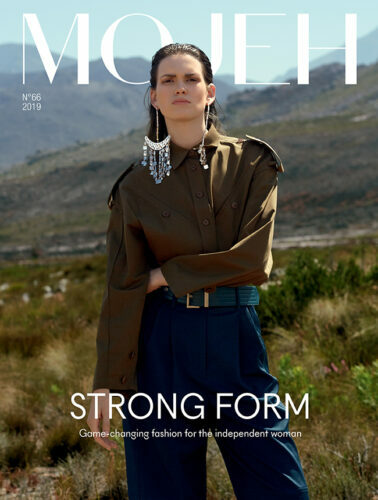 This will feature bags designed and made in Dubai that are embellished with traditional handcrafts such as local Taleh work, Swedish Sammi plaiting, macramé knotting and beadwork.